Joyce is a part of Animal Compassion Team, an animal rescue in Squaw Valley. In honor of Valentine’s Day I thought I’d share two of my favorite foster love stories. In the rescue world we face a lot of heartbreak and often see the dark side of humanity so those glimpses of love and the angels that come along side and take our broken little ones home, make our journey worthwhile. I will never forget Lilly. I spotted this tiny little girl as a stray in the shelter. She was a mess! Lilly had hair loss, she was old, her ears were picked at by flies, and her front leg was deformed and the nails on that leg looked like a corkscrew. She was huddled in the corner seemingly as aware of her fate as the rest of us. Needless to say, she stole my heart and came home with me. Lilly bloomed with some good old fashioned TLC. With good care and nutrition, her coat started to grow again. The wounds on her ears, once bitten by flies, healed and Lilly started to feel better. 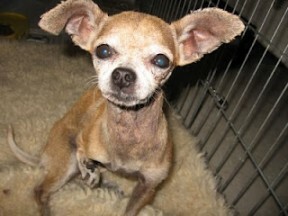 Despite her physical neglect, the humans responsible for Lilly’s condition couldn’t crush her spirit. Lilly’s inner beauty was apparent from day one. Lilly’s leg didn’t slow her down. She would scamper about and keep up with even the big dogs. She was a delight and a pleasure to have around. You can see a very short video of Lilly right here. I loved Lilly and she could have stayed with me forever; in fact, I thought she probably would. Lilly isn’t exactly what we refer to as “highly adoptable.” I took her out to adoption events with me and she evoked a lot of emotion in people but it took a child to realize her true worth. The boy was not going to budge that was his dog. What a wonderful mother and a wonderful family. They took Lilly home that day. A follow up phone call put my mind and heart at rest: within a very few short hours, Lilly had stolen the heart of the entire family. I haven’t heard since, but I hope to this day, Lilly is hobbling around sharing her special kind of love. Vixen had a very special job to do. 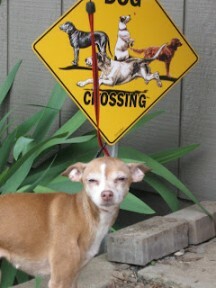 None of us knew that at the time this very sick little Deer Chihuahua came to live at my house. Vixen was with my family for several months. We loved her and she loved us. Vixen was my little shadow and it wasn’t easy for me to give her up. We learned of an elderly couple that was looking for a dog: a friend. I took Vixen on a home visit with the couple. I wanted to be certain of the match. The woman informed me that she didn’t have long to live and needed a friend for her husband when she died. Although very sad, the sincerity and selflessness of the dying woman was somehow beautiful. I’ll be honest, I was concerned for Vixen. I didn’t want her to bond with another human only to be abandoned yet again, this time through death. She loved me and I felt that I was betraying her trust by leaving her behind. It was a really hard for me to leave Vixen behind that day but I knew that she had a very important job to do. I made follow up phone calls and although it took a few days, Vixen settled in nicely. It was the woman and not the man that she bonded with. Vixen would lie on the woman’s bed hour after hour, keeping her company and keeping watch over her. Vixen never left her side. The following story was relayed to me several months later: Vixen was the woman’s constant companion. The family thought it odd when suddenly Vixen refused to enter the woman’s room and instead would spend her days sitting in the man’s lap. The woman died a few days after Vixen’s refusal to enter the room. Vixen knew her job was done with the woman and knew her work had just begun with the man. She became his comforter, his friend. Vixen became quite ill shortly after the woman’s death and I’m told the man said that “no matter the cost” get her well. He said that he and his wife owed her so much. Vixen did get well and I hope is blessing the man to this day. There is something so special about animals. God said it in the Bible. Writers have captured the bond between humans and animals in literature and films. How is that we continue to throw them away? Why are we continuing to kill them in our shelters? Why do we disregard their value? I’m sorry to end every feel good story with these questions, but it is because of these special moments that the waste and senselessness of the killing and thoughtlessness haunts me. Tell a friend, get involved, spay and neuter. Create your own happily ever after with a needy animal today. You will never regret it. Learn more about ACT in their article here at KRL & watch for a new adoptable pet from ACT on our home page every week. I so look forward to reading your articles Joyce! Once again you’be made my day!